This months Virtual Book Club for Kids is finally here and I’m so excited as we’re featuring one of our favourite authors this month: Dr Seuss. this month. It’s amazing to think that I hadn’t read any books by Dr Seuss until a couple of years ago. As part of the virtual book club for kids, I was introduced to some of the early reading books to share with kids. In particular The Foot Book, was especially fun – we did an extended activity, and had fun learning left from right in the snow. 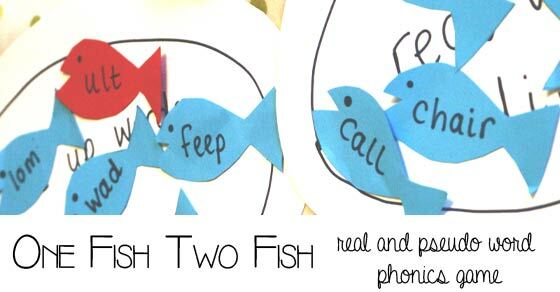 This month we have been reading One Fish Two Fish Red Fish Blue Fish [affiliate link], a fun, rhyming book ideal for emergent readers and one that’s great fun to read together. A couple of reasons I love Dr Seuss books are the made up words (or as J calls them: “pseudo words”) that appear in the books, as well as the play with rhymes. J has learnt to read using phonics as well as sight words, and his first statutory school test is coming up at the end of this school year. It’s a phonics test where he has to identify real and pseudo words reading them out on the screen. 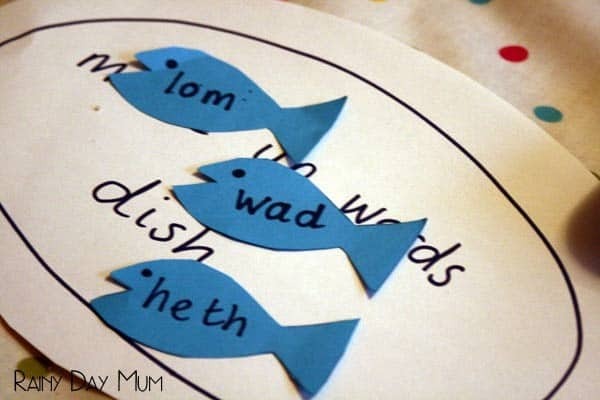 If your child is in year 1 in the UK they will likely be doing this as well, but even if you are based elsewhere in the world, reading made-up words is a great way to check those phonics skills. 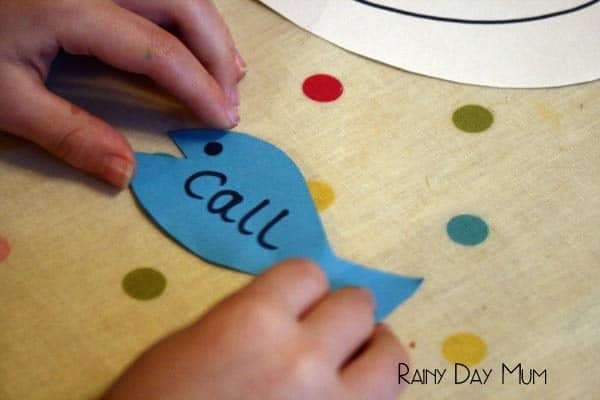 You can also adapt the words that you use for younger and older children based on the phonemes, digraphs and trigraphs that they know. Cut out two ovals from the large sheets of white paper. These will be the dishes to put the fishes on. You can make them look more like a dish by drawing an oval inside. On one, write “Real Word Dish”, and on the other “Made- up Word Dish” (or you could use “pseudo word dish”). 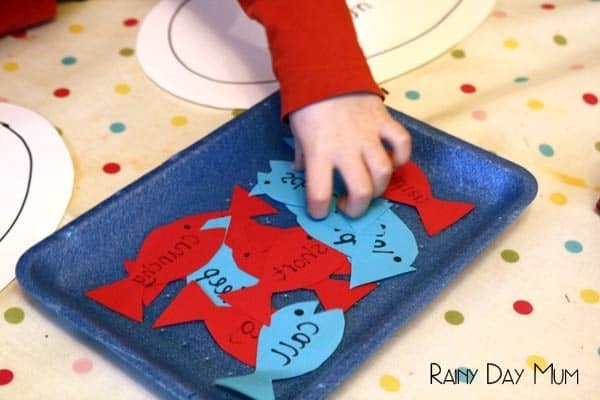 From the red and blue paper, cut out some fish. I drew a very basic fish shape and then used this as a template to cut out some more. 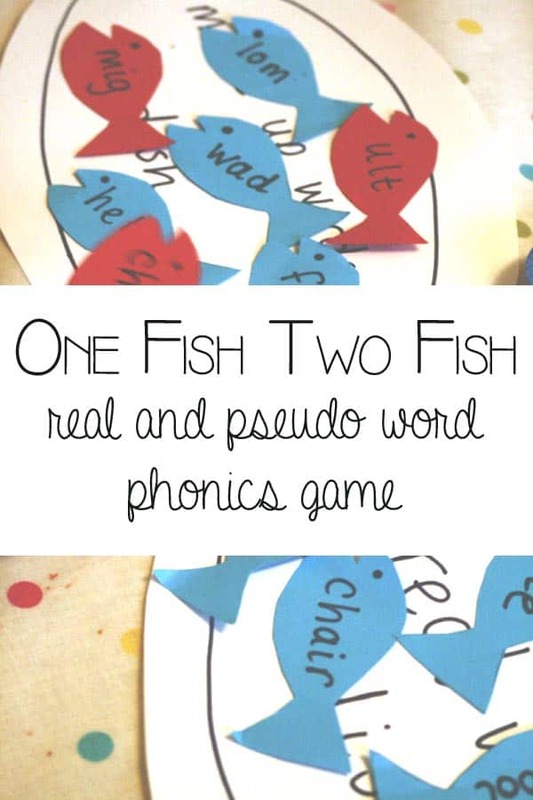 In total I produced 16 fish: 8 that would have real words on them and 8 with pseudo words. 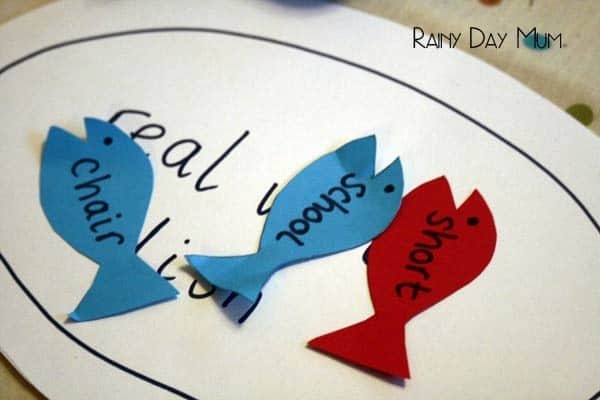 On each of the fish write either a real word or a pseudo word. Try not to all of your real words on one colour of fish and all of the pseudo words on the other. If you have a quick learner they may quickly pick up on this and ignore the reading of the words. If you need some inspiration for words to use then I discovered these lists of real and pseudo words from Primary Tools that you can download. These can be really useful for children learning to read using phonics. 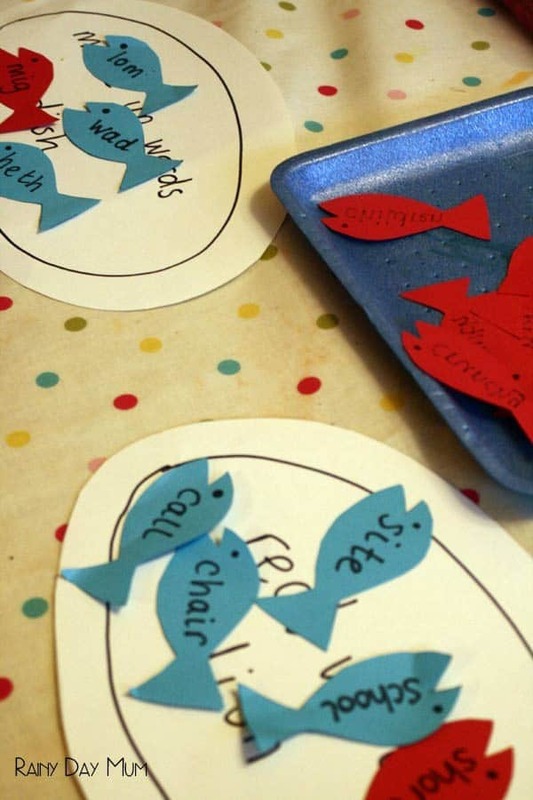 Lay out the dishes and the fish on a blue background to mimic the water, and then ask your child to fish for a word and bring it out. Looking at the word, have them use their knowledge of phonics to read the word. You may, like us, find that they are already able to read the word, as they are sight words, but don’t worry, it’s still good practice. Once they read the word they need to decide whether the word belongs on the real word dish or the pseudo (fake) word dish. Then move onto the next word and have your child read it. If your child needs help with a letter, or blending letters together, give a hand where needed. As each word is fished for and read, review the letter sounds and the blends to help them learn. As I finished playing the game with J, I realized that I should have laminated the fish. Then we’d be able to change up the words, and play again and again. This would be especially helpful as he approaches the year 1 phonics test. 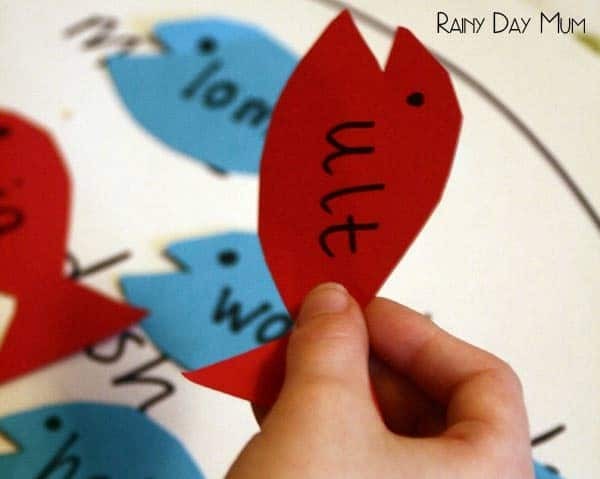 It would also be a good way to practice phonics and blends with words that your child is learning and knows already. This month, as our featured author for the Virtual Book Club for Kids is Dr Seuss, you’ll find more posts from the co-hosts featuring activities and crafts based on One Fish Two Fish Red Fish Blue Fish, Cat in the Hat and the Lorax. Look below for more Dr Seuss learning and creative inspiration.